Voltaren Dolo 25 mg 20 pcs. Voltaren Dolo Liquid 25 mg 20 pcs. Suffering back, joint or muscle pain? Voltaren can help! It eases pain and inflammation to restore supple movement to the affected area. Available in tablet, gel and plaster form, you can order all Voltaren products through Dokteronline.com, from our partner pharmacies. Voltaren K tablets, containing the anti-pyretic (fever-reducing), analgesic (painkilling) and anti-inflammatory substance diclofenac. This is a so-called NSAID, or nonsteroidal anti-inflammatory drug. The tablets are also suitable for treating period pains and headaches, as well as pain caused by colds or flu. They are available in dosages of 12.5 mg and 25 mg.
Voltaren Emulgel, a fast-acting gel to rub into the affected areas. The active substance, diclofenac, eases pain, swelling and redness, making the gel perfect for the localised treatment of pain in the knees, finger joints and so on. Always read the enclosed patient information leaflet before use. If your symptoms persist, consult a doctor. Voltaren K tablets: headache, dizziness, gastrointestinal disorders, skin rash. 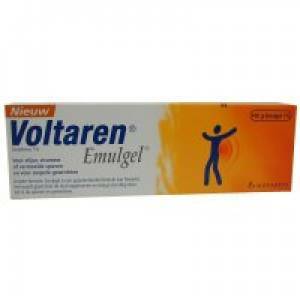 Voltaren Emulgel: skin complaints, including discolouration (Emulgel) or irritation at the point of application. See the leaflet enclosed with your product for full details of possible side effects. Voltaren K tablets are not suitable for people with a gastric or duodenal ulcer, gastrointestinal bleeding or a serious liver or kidney condition, or those who have suffered heart failure or a stroke. Do not use this medication if you are taking anticoagulants or if you are pregnant or breastfeeding. Voltaren Emulgel is not suitable for women who are pregnant or breastfeeding.